30% of QNAP users choose to build RAID 5 array for their NAS for higher data protection, better system performance and more available storage space. The TS-328 is QNAP’s first 3-bay NAS, allowing you to build a RAID 5 array on your NAS with the fewest disks. Powered by a Realtek quad-core RTD1296 processor, the TS-328 features a minimalist design that easily fits into your home or commercial space. With a variety of multimedia applications, transcoding capabilities and cross-device file backup and synchronization, the TS-328 provides a highly cost-effective solution for storage, backup, file management, and sharing. The TS-328 supports 4K H.264/H.265 hardware decoding and real-time transcoding , allowing you to convert videos to universal file formats that can be smoothly played on multiple devices*. Therefore, you can easily share movies or travel videos saved on your NAS to your family and friends via shared links and they can enjoy watching the videos smoothly anytime and anywhere. *The TS-328’s hardware provides H.264 /H.265 10-bit hardware decoding, encoding and transcoding capabilities. However, playback quality may vary due to factors including playback software, file formats, system usage, and available bandwidth. Note: All the drives bays of the TS-328 support SSD caching. The TS-328 comes with one 2.5-inch HDD/SSD drive tray base. You can purchase additional drive tray bases from QNAP shop. QNAP IFTTT Agent integrates the popular web automation service IFTTT (If This Then That), allowing you to create a near-unlimited number of automated workflows. Simply connect your IFTTT account with your TS-328 and set triggers and actions. For example, if you set a trigger as “Any new photo on the phone” and the action as "Upload the photo to QNAP NAS," then all the photos taken using your phone will be automatically uploaded to TS-328. QNAP provides a wide range of multimedia applications for you to easily enjoy photos, music or videos. QVHelper allows users to stream media files or music playlists from a QNAP NAS to VLC player. Qmedia allows music, photos and videos to be effortlessly streamed to Android TVs or set-top boxes. Video HD is a free KODI add-on that combines KODI's streaming and video decoding capabilities and fully supports Video Station's features. Use File Station to directly access files on USB devices - including optical disc drives. Files from USB devices can be easily backed up to the TS-328. OCR Converter extracts text from images, helping to facilitate file organization, editing, and searching. Qfiling automates file organization. Files are automatically archived into folders based on your settings. Qsirch supports keyword search for finding images, music, videos, documents, and emails, making it easier than ever to locate files. The TS-328 sports a stylish elegant look with an industrial design concept to provide better cooling for the NAS. The tool-less 3.5-inch hard drive installation allows easier system setup and maintenance, while the front-panel LEDs assist in viewing the system status. 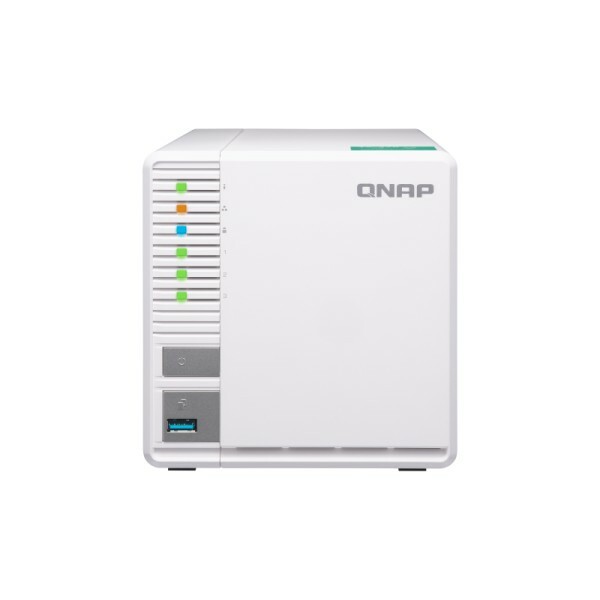 With integrated data backup, restore and synchronization, Hybrid Backup Sync helps you easily backup or synchronize data on the TS-328 to other QNAP NAS, USB storage (one touch copy) or cloud storage. With Qsync, you can also access your NAS files from PCs, laptops or mobile devices connected with the TS-328 at any time. Container Station integrates LXC and Docker® lightweight virtualization technologies. You can download apps from the built-in Docker Hub® to easily import/export container apps and manage access controls, enjoying the benefit of easy installation, transferability and high-efficiency.